VIDEO feature trailer is up! 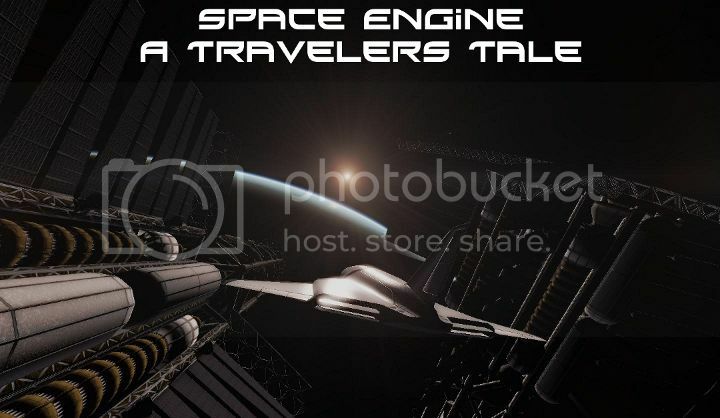 I will be doing an episodic series of Space Engine with narration by Mitchell Lucas. I will start from earth and traveling to the outer reaches of the universe. On our journey we will encounter planets, moons, suns, asteroids, galaxy's and many other astronomical objects. The series will be also a story about us, how we should put down our differences of petty war in-order to work together to create a new space exploration frontier for our children, and grandchildren and for many more future generations. During my journey, I will also talk about my own personal reflection about what I encounter in space. The choice of music that will be featured in the series will be from the television series Cosmos by Carl Sagan, and it will also future other ambient space music. Check out parfolio of Mitchell Lucas. I for one cannot wait to view your series. I love the fact that it will be done in the spirit of Dr. Sagan; I am certain he would be proud. I am remaking that pathetic trailer I had, actually it was not a trailer relay. Time to get busy, will have it up by 6:00 PM central time. Can you make it in 1080p? The title picture up there or the series? If you mean the series then defiantly yes. HD all the way! Would you please PM me? I would like to discuss something with you. Don't worry, it is a positive thing concerning textual editing and proofing. My first reaction to the trailer is that it's strange and jarring to use the shuttle when you're talking about the Apollo program in 1969. I understand using it as a placeholder, but it really should be the apollo spacecraft. Also, could you please, please, please be considerate to those who are hard of hearing or deaf and use subtitles or text along with speech? Just saying as some people don't, thanks. I do understand that it was not the best choice to do, but I just had to use what I did have. I do not know how to model and the time to do that is unfortantly not with me. It was for a place holder, but I think the most important thing is just to get the messege across. I also hope that people did not get confused when I said "Why not sail to other worlds?" I should have been more clear about that. Obvisily we do sail, but not man and its flesh to other worlds. To stand on mars with our flesh and bones would be nothing but beautiful. Also regarding the deaf, I have not thought about that, forgive me if that sounds selfish, its not. We just in our everyday lives take too much for granted. But yes you are right. Youtube does have a subtitles mode to turn on, im sure I can use that. Thank you for concerning that. This could be pretty nice. I wish you good luck on the project. I would be glad to see the sequel. Actually that was a trailer you saw. If you think that is epic, just wait. You have not seen anything yet.